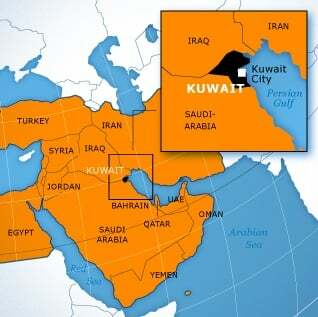 Kuwait lies at the head of the Persian Gulf, between south-eastern Iraq and northern Saudi Arabia. Its land area is roughly 18,000 square kilometres. The crescent-shaped country folds around Kuwait Bay, the best natural harbour in the Gulf. Kuwait consists primarily of a sandy, arid coastal plain, which slopes down slightly from west to east. The highest point in the country, near its eastern border, with Iraq, is about 300 metres high. Nine islands, some of them contested by Kuwait’s neighbours, add to the country’s small surface area. The largest is Bubiyan Island in the north, connected by a bridge to the mainland. The second, Failaka Island, across from Kuwait City, is believed to be part of the ancient civilization of Dilmun; it has been largely uninhabited since the Iraqi invasion of 1990 but remains a tourist site.